Looking for the best ant killers for the kitchen? How to find the ant nest creating your ant problem in the first place! Our 4 favorite products to stop ants from getting in your kitchen. "How to get rid of ants in the kitchen", a question many home makes tend to struggle with. The truth is, ants are most often found trailing in kitchens because they’re looking for food. Although ants are harmless (and disease-less), the thought of ants on your kitchen counter is horrifying. Here are some of our top product picks when it trying to answer, "how to get rid of ants in your kitchen" while still maintaining your sanity. How do I find the ant nest? What're the best products to get rid of ants in the kitchen? In a hurry? Here's the top picks. Keep reading for more details. Proper sanitation techniques can go a long way to preventing ants from invading your kitchen and home. Most ants in your home are simply looking for food, so the harder that it is for ants to find food in your home, the less likely that they’ll stay to look. Wipe down countertop surfaces. Have you ever noticed that ants tend to walk in straight lines outside and in inside your home? This is because the scent left behind so that other ants will be able to follow the same route to food sources. Using a strong disinfectant wipe to eliminate the ant trail will make it more difficult for future ants to find their way into your home. Alternatively, you can place bait along their path, which will then be brought back to their queen and slowly decay the colony. Keep trash sealed and move open garbage frequently. Store food properly with airtight containers. Seal entry ways to keep ants from crawling through the cracks in your windows, doors and walls. Clean up moist areas in and around your house (e.g., sections of your basement, near your foundations, etc). Keep trees and shrubs from creating a bridge to your house and move vegetation ﻿away﻿ your house. If it's too late, and you already have ants in your kitchen, then finding where the ants are nesting is your next best way to solve your problem. If you’re able to track down the ant colony, you’ll be able to lure out the queen and stop the ants at the source. Try to track where ants are coming into your home from, and where they are heading after they leave your home. This takes some patience, but once you’ve captured the queen, you can destroy the colony and end your kitchen ant problem. Here’s a video that shows you how to catch a queen ant in just fifteen minutes! Ants are persistent creatures, and they’re social. Where there is one ant, there are many more to follow. That’s why getting rid of ants in your kitchen can be an especially complicated task. These are the best products (natural and non-natural) out there to help keep ants away from your kitchen. Vinegar is the next top household product to get rid of ants in your kitchen. Mic a 50/50 solution of vinegar and water and spray directly onto the ants to kill them. Spray around windowsills and doorways to mask any existing ant trails. I recommend Heinz White Vinegar. Mix equal parts liquid dish soap with water, and keep a spray bottle handy to strike any stray ants in your kitchen. The dish soap kills ants on the spot and doubles as a needed house hold item for dishwashing. I recommend Dawn Ultra Dishwashing Liquid Dish Soap for the task. Food grade diatomaceous Earth (DE) is harmless to humans, but will dry out almost any pest with an exoskeleton, including ants. Sprinkle some DE in corners, cabinets and other other hard to reach nooks and crannies for a long-lasting ant fighter. I recommend Diatomaceous Earth Food Grade. TERRO Prefilled Liquid Ant Killer II Baits: These baits attract ants to a sweetened liquid with active ingredient borax inside. They tend to attract more ants than other ant baits out there because they are a liquid and easy for ants to consume and spread to their colony. The more ants take the active ingredient back to their colony, the more ants get killed at the source of the problem. That means less ants in your home in the long-run. Why it’s the best: TERRO Prefilled Liquid Ant Baits kill ants that enter them, but also create a ripple effect in the colony. They’re also prefilled, which means you don’t have to handle the bait as with other products. 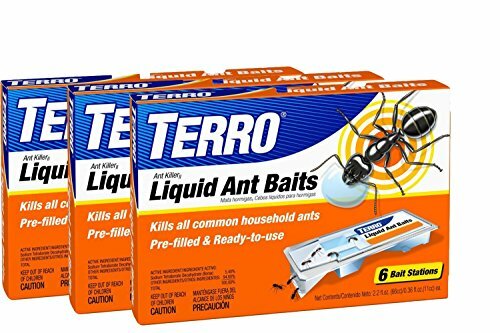 TERRO is one of the most effective, widely known ant killer brands out there, and their products work the best on the market when other ant deterrents fail. Click here for a full review of this product! Combat Ant Killing Gel: Since it’s a gel, it’s durable and can be used both inside and outside of your home. In your kitchen, the gel will work in crannies and cracks that ants may be entering from. It comes in a syringe, so it’s easy to handle. Why it’s the best: You’ll be able to cut ants off with a versatile, injectable gel. 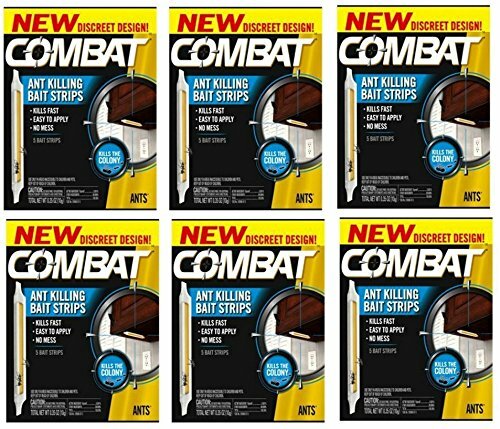 Combat Ant Killing Gel is especially effective when you know where the ants are coming from. The gel will act as a sticky, first line of defense before the ants make it into your kitchen. Fipronil, the active ingredient, works slowly to allow ants to take the gel back to their colony. Like the liquid ant baits, the gel kills ants at the source of the problem. It’s exterior grade, and will be just as effective against ants inside the house as outside. TERRO T401 Ant Killer Aerosol Spray: This product is for those who don’t want to kill ants with their hands when ants are scurrying across your kitchen floors or kitchen countertops. It’s the best ant killer that can kill ants on contact. TERRO T401 is an aerosol spray that kills groups of ants in one shot and you can instantly get rid of ants anywhere that you see them. The TERRO T401 residue also kills ants for up to a month out from the original spray—The spray will dry any ant that encounters it for quite a while. Why it’s the best: Other products are not as powerful as this one at killing ants in your kitchen immediately. It’s also the longest lasting spray on the market, killing ants up to a month from initial spray. This is because TERRO T401 is specifically meant to work on ants, where other sprays target a variety of pests. 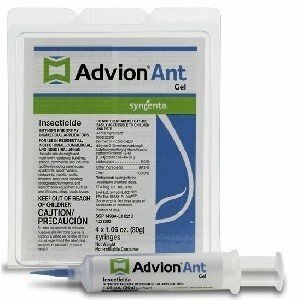 Advion Ant Gel Bait: This is the top product on the market to kill ants. It’s proven time and time again to work in a short period, although it’s most effective inside your home. This gel will attract hundreds of ants in under 3 hours. The longer you leave the bait out, the more ants will come to eat it. Although the sight of swarms of dying ants may be repulsive, don’t wipe the gel or clean up the dead ants if you can help it! This gel is most effective if left for several days before being cleaned up. Placing a few of these baits in different areas of your kitchen will speed up the process of significantly, but you’ll clear a large majority of ants in your kitchen. Why it’s the best: There isn’t another product on the market that will annihilates swarms of ants like this one will. Advion Ant Gel Bait will clear your kitchen of ants in just a few hours. Left over a few days, you’ll have cleared a large majority of ants effectively. The bait works like other ant bait systems, but the powerful formula impacts all life stages of the ants for total colony control. The ants more quickly and seems to last longer than other products. Keeping those pesky little ants out of your kitchen is difficult in the late Spring and early Summer months. Making sure you’re both preventing the ants before they infest your kitchen is the first line of defense to prevent an ant invasion. Utilizing the best products and methods for getting rid of ants in your kitchen as outlined above can help keep any kitchen ants under control throughout the year. Any questions/concerns? Leave a comment down below!